On Tuesday morning, May 9, the van was loaded with three core members, three assistants, and enough materiel for an amphibious landing. By 9am “L’Arche Across America” was underway, headed for L’Arche Syracuse. The plan is an 8,000-mile, 26-day adventure, threading its way through 12 L’Arche communities and visiting sites from Glacier to the Grand Canyon, all while living L’Arche. The plan is for core members Woody, his wife Doris, and John D, together with assistants Jane, Todd, and Webster, to return to Haverhill and know it again. But only after a once-in-a-lifetime adventure. It didn’t start, um, perfectly, as Webster reflected in a personal blog post. But by 3:30 or thereabouts the six adventurers were seated in a living room of one of the homes of L’Arche Syracuse, participating in a prayer gathering. Wednesday they were headed to Niagara Falls and L’Arche Cleveland. Thursday to Chicago via Cleveland’s Rock-and-Roll Hall of Fame. And so on westward to the Pacific. This page will be updated at least once a week. 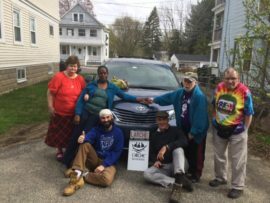 You can follow the adventures daily on L’Arche Boston North’s Facebook, Twitter, and Instagram pages by using the hash tag #larcheacrossamerica.